Dessert or Breakfast? You decide. 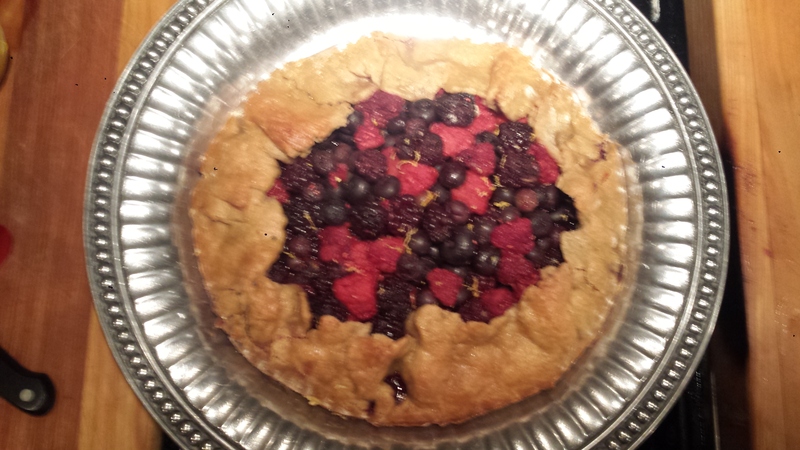 This beautiful tart is my new favorite throw-together fruit dish, made with fresh summer berries, lemon zest and just a bit of sugar, folded into a whole grain crust made with white whole wheat flour. 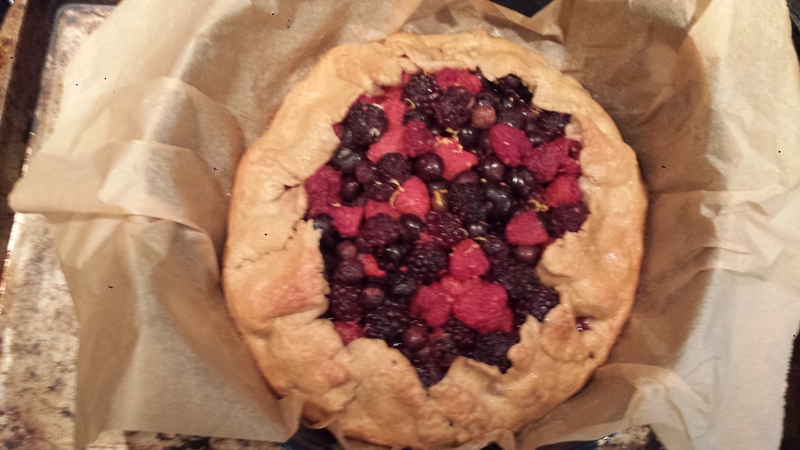 For a tart it’s pretty healthy, so I have actually made it for breakfast when I’ve had guests. Either way, it’s a crowd pleaser and you won’t have any leftovers! 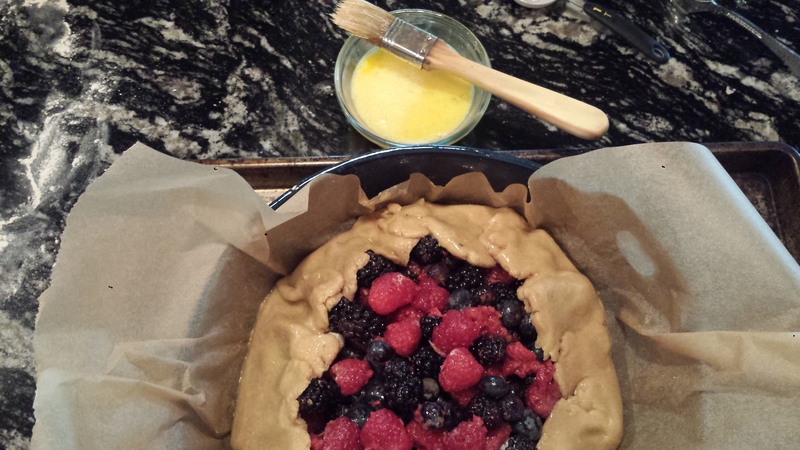 I have made this tart three times now. Twice with store bought crusts and once using the following recipe for white whole wheat crust. The store bought crusts were perfectly fine and made it super quick – five minutes to prepare and right into the oven. However, I really preferred the homemade crust, which was slightly thicker and had more of a rustic feel. It also contained the juices better. 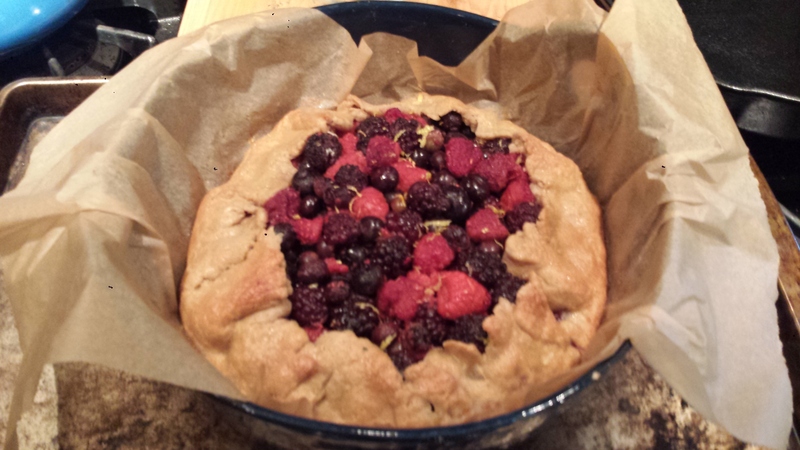 The crust was surprisingly easy to make but requires chilling time, which must be taken into account. I have also used coarse sanding sugar, which adds a ‘professional’ look to the tart and a nice, crunchy sweetness to the crust, but regular granulated sugar works fine too if that’s what you have. So what is up with white whole wheat flour? I love to use whole grain flour whenever possible for cooking but sometimes taste or texture is compromised because whole grains are often heavier and have a stronger taste. 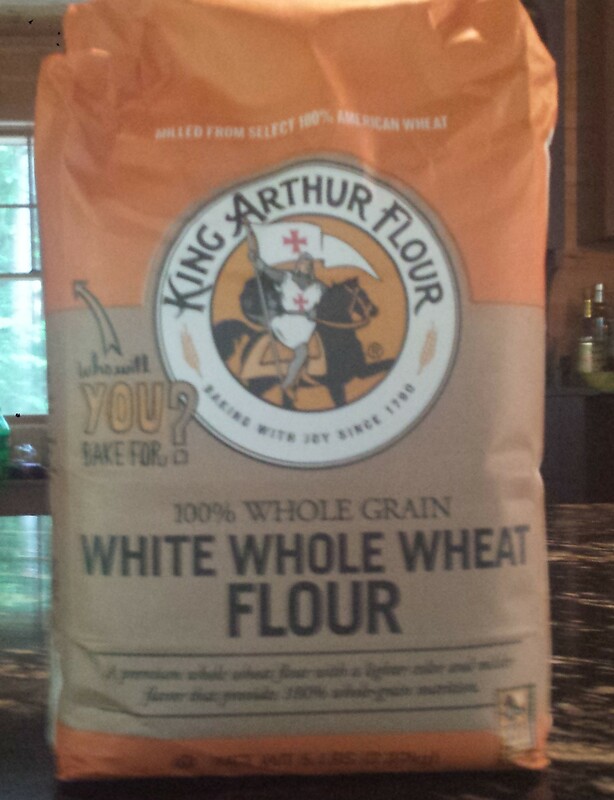 I have recently started using an unbleached white whole wheat flour from King Arthur. The flour is milled from 100% organic hard white spring wheat, a lighter-colored and more mild tasting grain than traditional red wheat, which means that baked goods taste better but still have all of the nutrition and fiber of whole grains. 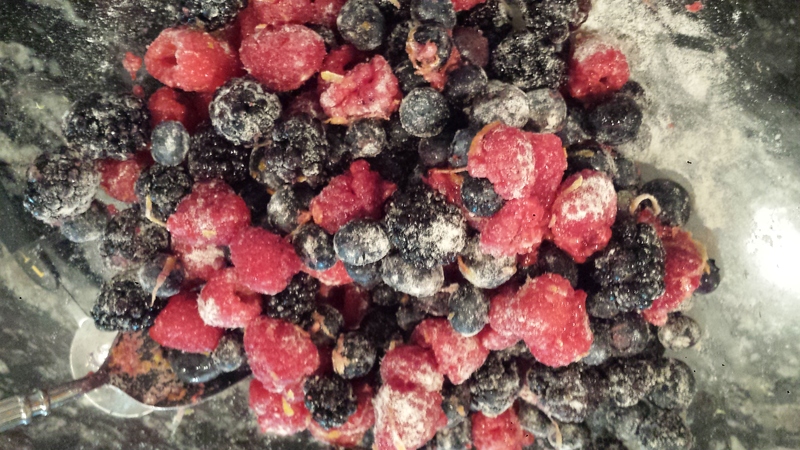 TIPS: This recipe can be personalized to your liking with almost any fruit. Just use four cups of fruit: whole small berries or thinly sliced peaches, apricots, pears, plums, apples or strawberries. Or combine two fruits for an interesting combo. Some fruits are sweeter than others, so adjust the sugar as necessary, and otherwise follow the recipe below. You can easily make 4 individual mini tarts from this recipe instead of one large one. When you’re finished mixing the dough, divide it into four equal pieces before pressing them into disks and wrapping them in plastic; refrigerate. Roll the dough into rounds about 7 inches in diameter and portion the fruit evenly among the rounds. Pleat the dough around the fruit to make a 1-inch rim. Bake as directed. If using your own homemade dough, prepare that first. Combine the flour, sugar and salt in a stand mixer or food processor. Add butter and pulse on low until the mixture looks sandy and no large pieces of butter remain. The flour should hold together when you pinch it with your fingers. In a small bowl, mix the egg yolk and milk. With the mixer on low, add them to the flour mixture and pulse until the dough just comes together, about 15 seconds. The dough will be somewhat crumbly and dry. Dump dough onto a clean counter and work it with the heel of your hand until the dough comes together. Press it into a flat disc, wrap it with plastic and let it rest in the refrigerator for 15 to 20 minutes before rolling it out. Preheat oven to 350. 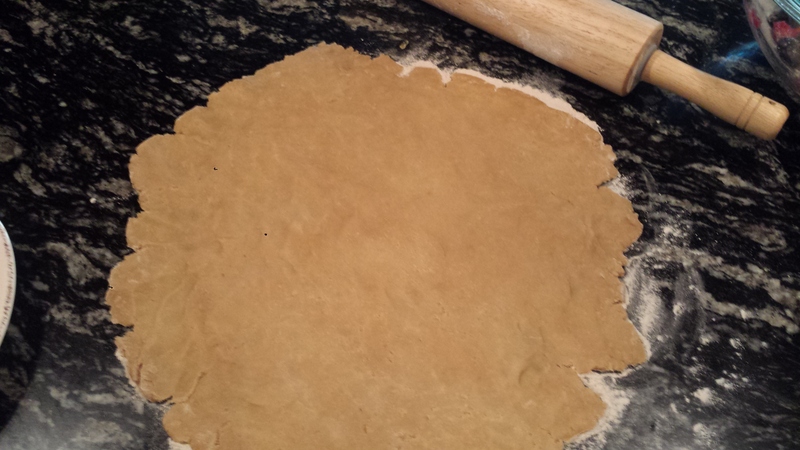 Remove dough from refrigerator and let it sit 10 to 15 minutes, or until it’s pliable enough to work with. Roll it out on a floured surface into a 13 to 14 inch round. Don’t worry about ragged edges. 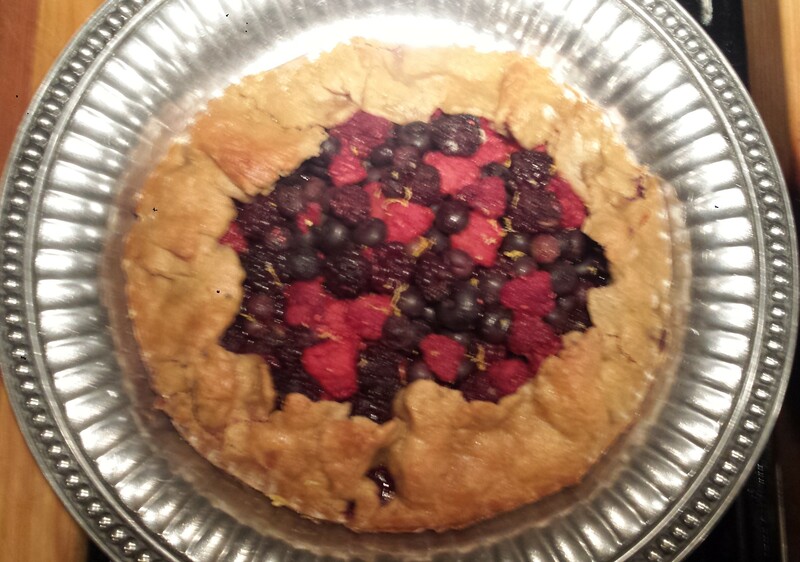 They only make the tart look more rustic. 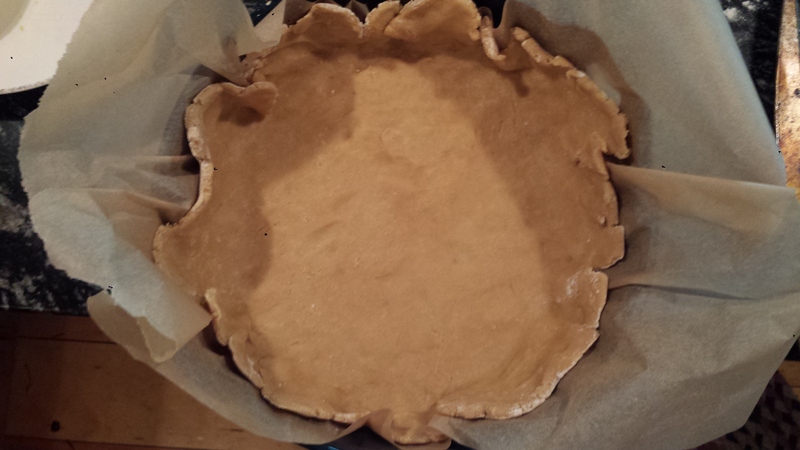 Transfer the dough circle to a baking sheet that has been lined with parchment. 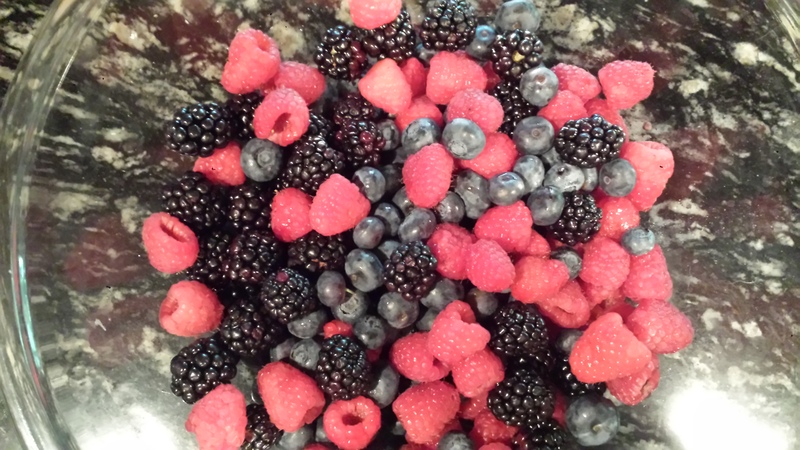 In a large bow, toss the raspberries, blueberries and blackberries with the sugar. Taste and add up to 2 Tbsn more or sugar, if needed. Add lemon zest, flour and salt and gently combine. 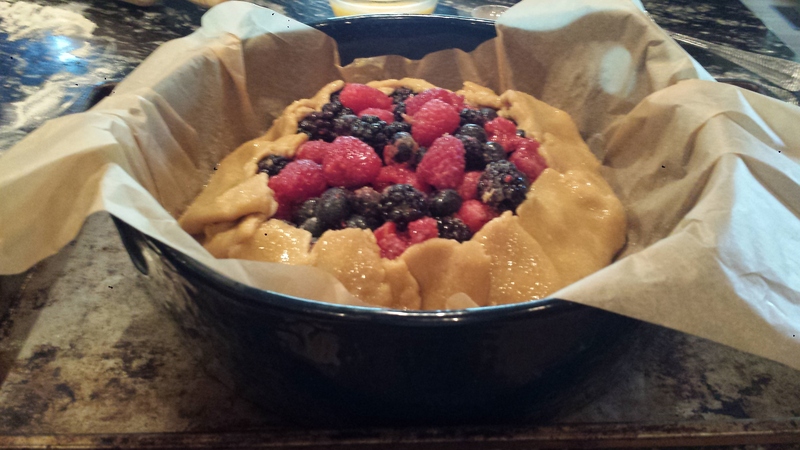 Heap the fruit mixture into the center of the dough circle, leaving a 2 inch border. 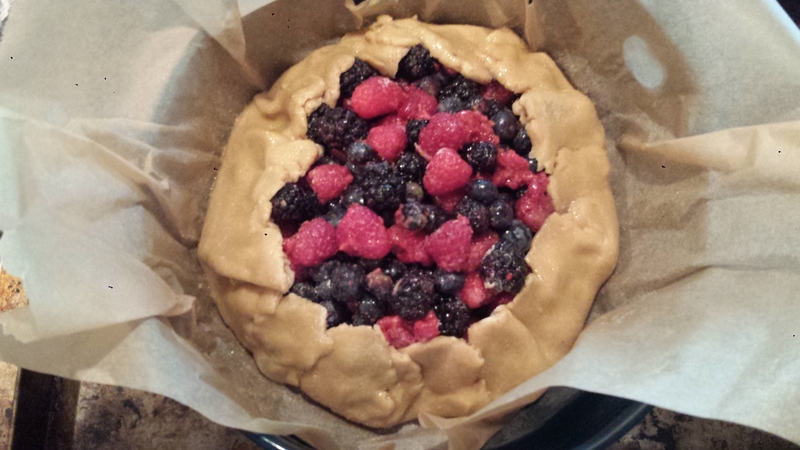 Fold the edges of the dough over the fruit, overlapping and pleating as you go. Brush the dough, with beaten egg (even under the folds) and sprinkle with sugar. Bake until the dough is golden brown, 40 to 55 minutes. Let cool. Transfer to a serving platter and serve warm or at room temperature. 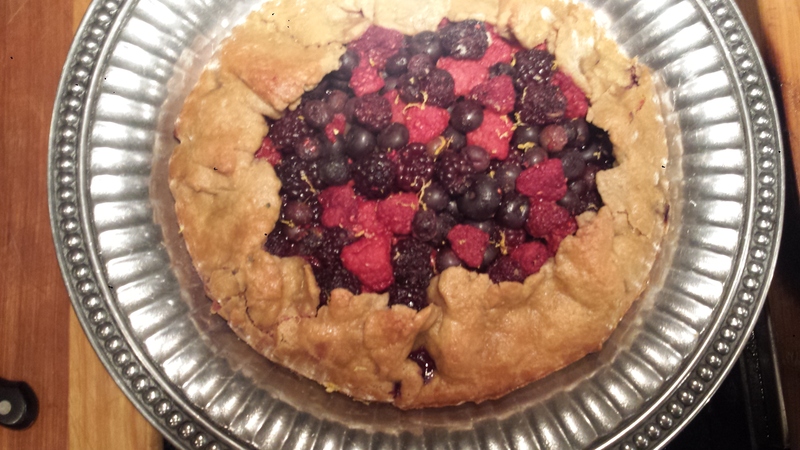 This entry was posted in All Recipes, Breakfast, Desserts and tagged Berry Tart with White Whole Wheat Flour, blackberries, blueberries, raspberries, Rustic Berry Tart, Rustic Fruit Tart, summer tart, Triple Berry Tart, vegetarian, white whole wheat flour, white whole wheat flour crust recipe. Bookmark the permalink.